Destination weddings are becoming more and more popular – I got married abroad myself! 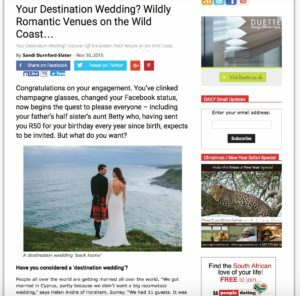 When SAPeople.com approached me to do a feature on destination weddings, I suggested that the Wild Coast would be an ideal unusual destination. I enjoyed researching and writing this article because the Eastern Cape is my home territory in South Africa. There are so many hidden treasures on the Wild Coast. Morgan Bay is fast becoming a popular destination, but it still retains its wild, abandoned feel. In this feature I have looked at Morgan Bay, the village. I have also considered the surrounding areas. I hope this helps you plan your destination wedding. You can read the article online, or click on the image above to download the pdf. For feature writing, contact me here.